A photographer on a quest to capture an image of the elusive world's largest bee found success while retracing the steps of famous anthropologist Alfred Russel Wallace, who jointly published some writings on evolution through natural selection with Charles Darwin in 1858. 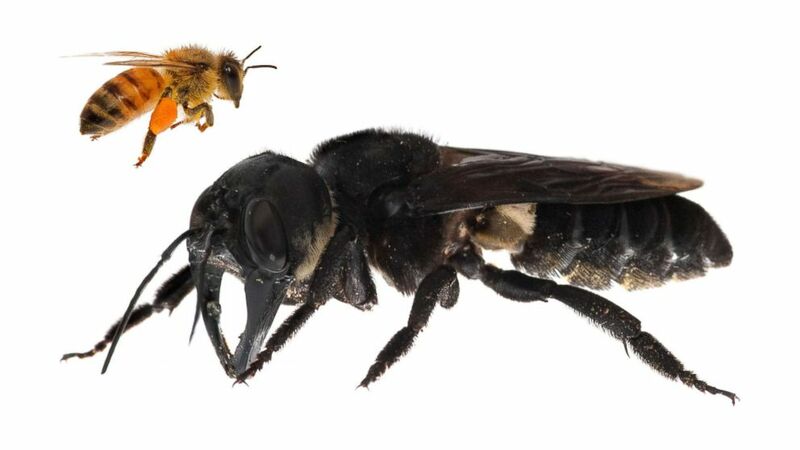 Clay Bolt's search for the Megachile pluto began with picking up a copy of one of Wallace's journals, "The Malay Archipelago," which detailed his travels through Malaysia, New Guinea and Indonesia in the late 1800s, Bolt wrote in a blog published Thursday on the Global Wildlife Conversation's website. The bee, commonly known as Wallace's Giant Bee, has been lost to science since 1981, Bolt wrote. It is "about as long as an adult human's thumb" and "a large black wasp-like insect, with immense jaws like a stag-beetle," Wallace wrote in his journal. The bee can grow up to 1.5 inches long and can have a wingspan of up to 2.5 inches, according to National Geographic. Bolt first caught a glimpse of the giant -- albeit dead -- bee in 2015, when he visited the American Museum of Natural History in New York City, he said. "It was more magnificent than I could have imagined, even in death," Bolt wrote. In late January, Bolt and three others flew to Indonesia because it was the same time of year that researcher Adam Messer last encountered the bee in 1981, Bolt said. After arriving in Ternate, one of Bolt's guides, Iswan, ended up having a "very sharp set of eyes and a passion for insects," he wrote. The bee, which is known to nest in active termite mounds inside of trees, emerged on the last day of searching on a low termite mound about 8 feet from the ground. "We immediately noticed that it had a hole in it, like many other nests we'd seen, but this one was a little more perfect," Bolt wrote. "It was very round, and just the size that a giant bee might use." Iswan then exclaimed that he saw something move, the other climbed up to determined that the they had "rediscovered Wallace's Giant Bee." "After doing a happy dance, I photographed the bee and shot some video proof," Bolt said. "My goal was to be the first person to make a photo of a living Wallace's Giant Bee and I had achieved that goal." Bolt now hopes to work with conservation groups to ensure protection for the species.